Over time I have ended up with a couple of customisable Tipro MID keyboards without the custom lead to connect them to a PS2 port. These leads are no longer available for sale so I decided to figure out the pinouts. This is a quick summery of that work. 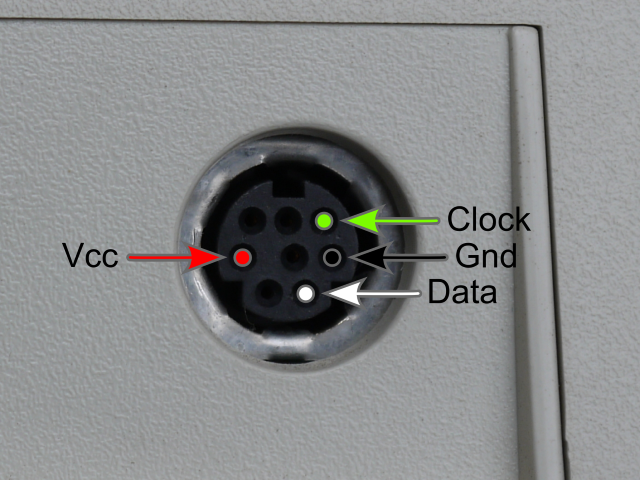 As the keyboards have a pass-though port for other PS2 devices and were unlikely to have a common ground and 5V line I could use a multimeter to check what was the “Gnd” and “Vcc” easily. This worked and I had those figured out after a few minutes. Now I had the power sorted I just had the clock and the data pins to figure out. I realised that there were only 30 possible combinations and the keyboard were already programmed so would behave like, well, a keyboard when a button was pressed. Rather than mess bout I decided to just try all combinations and to wee what one worked. There was a remote change this could damage the hardware but that was very very unlikely and I had little to loose. As luck would have it it worked on the 3rd attempt. So now we have the results. 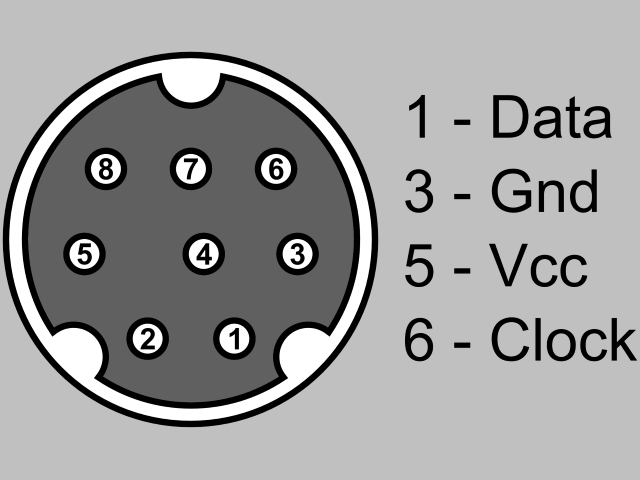 The layout is not dissimilar to that of a a PS2 connector albeit mirrored. Hopefully this will be of use to at least someone and save some hardware from the skip. My next challenge is to reconfigure them. The configuration utilities (MIDWIN and MIDDOS) are still available from the Tipro drivers archive although it is recommended you use Windows 95, 98 or 2000. Wish me luck. 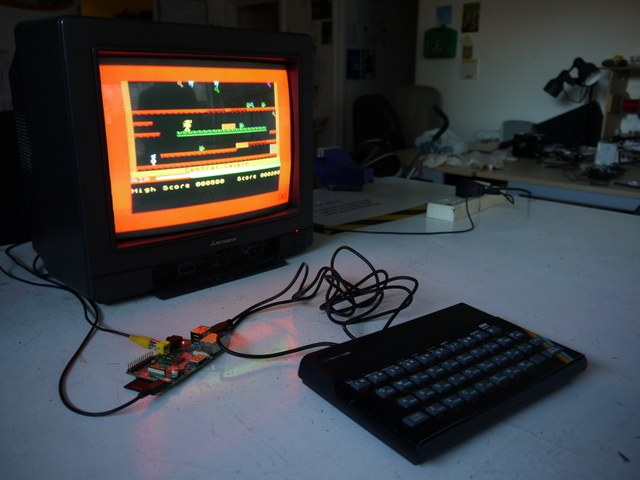 As part of my ZX Keyboard project I wanted to run a Spectrum emulator in full screen on the Raspberry Pi. Next we should make it start in full screen. From the console type in “fuse-sdl” and the emulator will start. Next press F1 (yes, sorry, the ZX keyboard does not have an F1 key so you will need to use another keyboard for now), select “Options”, and “Full Screen”. To make this the default press F1 and select “Options” again, then select “Save”. To exit use the F10 key. Now I think we will need a good old game to play. The best place to look for Spectrum games that are distributed legally is at http://www.worldofspectrum.org/ . The simple way to load a game using the ZX Keyboard is from the command line. For example we can load Manic Miner (assuming we downloaded the game and extracted it to the working directory) with the following command. Annoyingly I have come across one problem with Fuse and the ZX Keyboard. Fuse maps each key to a Spectrum key, letter to letter, number to number, shift becomes Caps Shift, and Ctrl become Symbol Shift. All other keys are ignored. This is a problem as we are interpreting and translating the symbols already. For example the Symbol Shift P as a double quote (a shifted 2), but the emulator treats this as the Caps Lock being pressed. We could make the ZX Keyboard work flawlessly by turning off our translation, but we would lose compatibility with PC software. I might look at building in a way to changing modes but we will have to cope with this for now. The ZX Keyboard, a USB keyboard made from an old ZX Spectrum on show at Manchester Mini Maker Faire. Several year ago I decided that I wanted to make an old ZX Spectrum keyboard work with an emulator and ended up making one in to a USB keyboard. This is the rather waffly history of the project with a few tips and links for building your own. I have also created a Hack a Day page for the basic build instructions and a GitHub repository for the files. Although I have never owned a working rubber keyed ZX Spectrum (mine was a Spectrum+ with a more solid tactile keyboard) I was given a broken rubber keyed one many many years ago. It was in a bit bashed up and did not work, and I have used a few of it’s components to fix other machines, but surprisingly the keyboard was okay. Back in the start of 2012 I wanted to mount a soon to be released Raspberry Pi inside and emulate a full ZX Spectrum, as well as a Commodore 64 just to mess with people’s heads. I waited until the Model B was Pi eventually available but it would not fit without making more modifications than I wanted, and the smaller Model A was a long way off becoming a reality. I then decided that instead of mounting the Pi inside I should turn it in to a USB keyboard so I could use it with a Pi or a normal desktop PC. Naturally I then forgot about it for another couple of years, until for some reason just now. Several people have asked why I did not use Bluetooth (some more criticising that asking, but whatever) and there was a Kickstarter making new Bluetooth ZX Spectrum style keyboards, but the project was to use an original ketboard, get it working with the Pi, and to do it myself. The hardware was surprisingly easy with the big unknown being the USB communication to which I considered a few solutions. Lots of projects use a Arduino Leonardo that can natively emulate a USB keyboard, or reprogramme the Arduino Uno’s serial controller that requires zero extra hardware, but will prevent the Arduino from being programmed via the USB port. I was keen to use a low cost (the one used cost £1.30) Arduino Pro Mini clone and a small number of basic components. Having decided on the Arduino Pro Mini (yes, I have my cart pull the horse for pet projects) the easy solution (for me because of prior knowledge) was to get the Arduino to emulate a PS2 keyboard and use a cheap PS2 to USB converter. If it was a one off commercial project, or I was against the clock then this is what I would do as it is the quick and easy solution that adds pennies to to cost of the project. This however is a daft pet project that is an ideal excuse to use as a learning experience, so I decided to play with the V-USB library from Objective Development. In the end I found the VUSB for Arduino library that had done a lot of the porting work for me, although I am bypassing the top levels of the library to increase compatibility and allow multiple keys to pressed. Now I have thins knowledge my default may well be to opt for USB for future projects. Connecting to the keyboard hardware was easy enough as I reused the original connectors from the old motherboard that already had components missing. The flat cable from the membrane was very tarnished and had cracks across the connections but I chopped an inch off the end and this solved the problem. The connections have been well documented by hobbyists over the years so there was no backwards engineering required. The way it is wired to the Arduino is not just to make things look neat mind. I will also help the software. Instead of having to check each button of each column at a time it is arranged so multiple values can be read in an operation. The key mapping took a lot of thought and I have tried to make the keyboard usable for normal operations while keeping full compatibility for Spectrum Emulators. 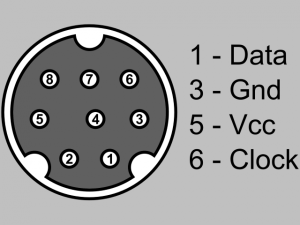 I think I have managed that and have written a little about how it works on the hackaday page mentioned at the top of this post. So that is it. I will be taking the keyboard to future hack days, Bar Camps, and Mini Maker Fairs if you would like to see it. I hope you are inspired to have a go at building one, perhaps a better one than mine. Do let me know if you do. 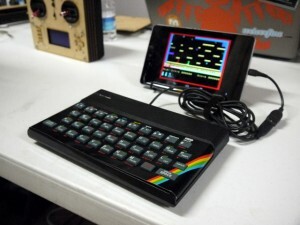 If you want one but don’t have the time or skills to convert your old ZX Spectrum (or any other machine for that matter) then I am happy to do it for a few quid so get in touch. Update: It appears that the latest Arduino IDE (version 1.6) will not compile the VUSB library because of an old big in it. A quick work around is to install an older version of the Arduino IDE. It works for me with version 1.0.5. In this post I reveal a little secret about Newcastle’s now defunct cycle hire scheme and make the cycle location data collated over two years available. 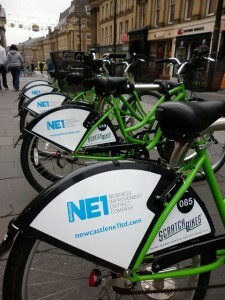 Until the end of 2013 Newcastle had a cycle hire scheme called Scratch Bikes operated by Grand Scheme (formally both WhipBikes Ltd and Scratchbikes Ltd). Back in 2011 I decided to use the cycle location information on the Scratch Bikes web site to make an amazing animation like the animation done using data from the Boris Bikes in London. Sadly I found that the data was anything but live so I could not. When I pointed out the web site and phone app were inaccurate Scratch Bikes were quite honest and came clean that the numbers were in fact entered manually when the bicycles were checked at the start of the day. I did offer to help link the systems together but sadly they did not respond to my offer. They did however try and hire a friend instead but I guess they had their reasons. So the data…. In 2011 I set up a server intermittently checking the Scratch Bikes web site to find out how many cycles were at each station. As mentioned the data only changed once a day and was not enough for my needs, but I had already coded up the scraper to discover this so decided to leave it running just in case it was useful. This ran continually for 2 years. I do not know if it is useful. You can download the Scratch Bikes Usage Data here. The time stamp is from the site and appears to be the time when the data was entered on to there system. There is a separate table with the location information in. One note is that I do not have the official data for Malcolm Street and Cuthbert House (presumed to be 3400 and 3405) so I have made a best guess. If you can fill in the blanks then please get in touch. Please take the data and do cool things with it, and let me know what you do with it. I will just close by saying that reimplementing the phone service and building a web service is not hard for someone like me to do. In fact I can have it up and running within a couple of weeks, the web site and app will be live and accurate, and you would be able to book out cycles by text, voice, from a smart phone, and a PC as well. If someone wants to team up make this happen again in Newcastle then get in touch. This month I am saying goodbye to a couple of services that I have been using for a while. First Posterous. At the end of last week it was announced that the micro blogging platform Posterous will be closing down at the end of April 2013. This has been anticipated for a while since Twitter bought it in March last year and assured users that they will not close down without notice and will create an official data backup path. I started using Posterous when I moved my “Vox Blog” to it (actually migrating to TypePad and then Posterous as it was easer) after Vox was closed at the end of September 2010. As this is a second blog of “silly stuff” that I do not upload much to it nowadays I have decided to just kill it off. I did consider moving it to another service such at Tumblr but it is not simple to get the archive in there and I have other things to do that are more important. I will however place a full copy of my Posterious blog on my web site and redirect from the original URL so the content will not vanish from the Internet. There is a small bug in the export where the original Import from Vox is listed backwards, and the Image URLs are mashed, but I fixed the URLs with a little .htaccess hacking. If you need help to do the same please do ask. Next is Dopplr. Dopplr is a service where you log where you will be travelling to and it allows you to see if your friends are going to the same location. When you attend a lot of events like I do it can actually be useful. The service has been running unchanged since it was bought by Nokia in September 2009. I give it a lot of credit for running apparently untouched for almost 3½ years. Sadly it has just started to play up by not allowing trips to be created, edited, or deleted. It is clearly not being maintained and about to die. Rather than move to another system (I only know of Tripit and it is not quite the same) I have imported my last Dopplr backup in to my Google Calender. Clearly this is not going to duplicate Dopplr’s social element, but will help with my planning and this is what I have mostly used it for in recent times. So that is two services gone and I suspect there will be more going before the end of the month. The Internet is always exciting because of the constant flow of new and exciting things on it, but most will eventually vanish or be swallowed up by other services regardless if they are successful or not. It is sad but the way it is.